Restoration or conservation? What’s the difference you may ask? 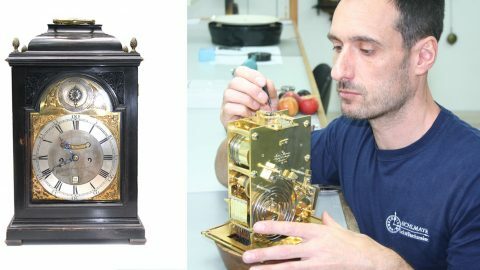 Because of the years of experience and qualifications that we have in traditional clockmaking techniques and clock repairs, as well as servicing and repairing every day domestic clocks, we are often appointed to carry out maintenance to museum grade conservation pieces. We currently have in our workshop a collection of museum grade pieces. One of them is a stunning William Cook fusee Verge bracket clock. This is an important clock which comes from a large historical collection of clocks. It is in a black ebonized case with brass pineapple finials and beautifully engraved plates. It strikes hourly on a bell and has a strike silent in the top arch. Records show that William Cook was a clockmaker in Kingston, Surrey between 1773 and 1795. Prior to 1800 clocks were completely made by hand including all of the individual components. This time period comes before the invention of the anchor-recoil escapement when clocks used what is called a Verge escapement (or crown wheel). This type of escapement has a gear train which advances at regular intervals rather than a pendulum. Because of the use of this early type escapement, Verge clocks aren’t the most reliable timekeepers and for this reason many clocks which have been restored have been converted to a recoil anchor escapement. In the case of this clock, it hasn’t been converted, making it far more unusual and valuable. We are not looking to convert it to make it a better timekeeper in line with more modern clocks. We simply need to slow down degeneration as much as possible without compromising its historical worth. Herein lies the difference between restoration and conservation. Keeping it as original as possible is more important than its performance. Following a system of thorough examination and research we will sympathetically clean and repair this clock. Unlike other antique objects which can be surface cleaned, a clock movement has to be completely disassembled, surface debris removed from each component and then re- assembled. There may be hundreds of components which have different surfaces. These can only be safely and effectively cleaned by hand in a non-destructive way using the mildest of solvents. Everything possible to is done to halt any oxidation or corrosion. Bearings, which are the holes in the front and back plates of a clock movement into which pivots are placed, often become worn. When this happens the distance between the gears increases and the gear teeth pivots and bearing walls then wear, making the clock more inefficient. The necessary filing is carefully done so that no more material than is necessary is removed. When bushings are replaced they are specially made to fit rather than using pre-made bought in bushings. Pivots are all carefully and meticulously polished. Unlike restoration processes, the treatment for the conservation of a horological mechanism should, if possible, be achieved without removal or replacement of materials or components but if a part is so damaged or worn that polishing will not allow it to work properly then the whole component will need to be completely re-manufactured. So, if we re-make a gear wheel for instance, then we will also remake the shaft and any other associated parts. These parts are made of similar material to the original but not made to look deceptively old. They need to be distinguishable from the original parts. New parts are signed by the clockmaker and all original parts are kept with the clock. So to sum it all up, we are proud of the fact that we can have the expertise to conserve these beautiful historical timekeepers and that we are good at it. We know the difference between antique clock restoration and conservation and will always guide you in the right direction. So, if you come to us for a quick, cheap repair, you just won’t get it and we’re not afraid to say that. We will take our time and do all that it takes no matter how many painstaking hours of handwork it involves because we simply have too much passion and knowledge to sacrifice our standards for an easy short cut. Of course there is a lot more to what we do, this is a very brief summary, so if you ever want to know more please just ask!